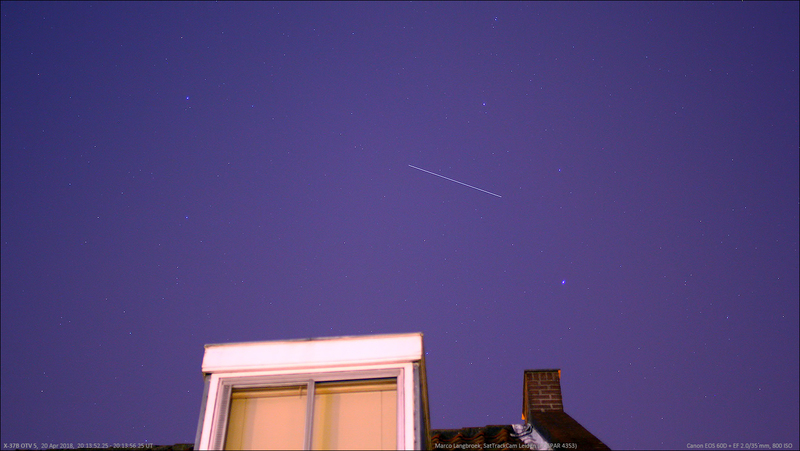 The image above shows the secretive X-37B Space Plane OTV 5, a robottic mini space shuttle flown by the US Air Force, over my house in Leiden, cruising through Leo (the bright star above the chimney is Regulus). It was a bright, easy naked eye object with a brightness of magnitude +1. In a previous post I detailed how (and why), following the launch in September 2017, we had a hard time tracking down the whereabouts of this fifth OTV mission. Untill Cees Bassa located it on April 11th, in a 54.4 degree inclined orbit. It is the first OTV mission bringing it to the latitudes of the Netherlands. Clouded weather in the Dutch coastal region after Cees' recovery prevented me from seeing it untill yesterday. During the past week, OTV 5 moved from morning passes to evening passes. Weather improved too medio last week, but still OTV 5 initially escaped me. Because it manoeuvered! On April 18th, a week after it was first located in orbit, OTV 5 made a manoeuvre. It was a no-show for several observers, including me, on the 19th, but two observers, Tristan Cools in Belgium and Marian Sabo in Slovakia, reported an "unidentified" object some 8 minutes earlier (which means it passed while I was setting up my camera on the 19th). Based on Tristan's photograph of that object, a post-manoeuvre orbit was guessed by Mike McCants as well as by me. Yesterday evening on the 20th, we were ready to look for it, and we did recover OTV 5, a few minutes in front of the estimated new orbit. The new orbit is still preliminary, but it seems as if the orbit has been lowered from a ~355 km circular orbit to a 307 x 320 km orbit. In a few days, when we have more observations, we'll know more about the new orbit, and when the manoeuvre exactly happened. This was my very first observation of an X-37B! Very cool to see this enigmatic object pass in my own sky. Given that previous OTV missions frequently manoeuvered, it will be an interesting object to follow. All kinds of nefarious motives and purported specific targets have been ascribed to the X-37B program by the aluminium hat brigade, but the reality probably is that the X-37B is an experimental test-bed for new space technologies, testing these under real space conditions and at various thermospheric regimes, over a prolonged time period, before retrieving them. I do find it interesting though that this new OTV mission is in a 54.4 degree inclined orbit, rather than the previous 38-43 degree inclined orbits (see comparison in my previous post). Over the past year we have now seen three experimental missions going (or planned to go) into 50-55 degree inclined orbits: USA 276; the failed Zuma; and OTV 5. All three are clearly experimental missions. For Zuma, I suspect it was meant as an experimental radar satellite, and maybe OTV 5 tests radar as well. Or maybe not. At any rate, I welcome this new attention to ~50-55 degrees inclination, as objects in such orbits are well observable from my 52-degree latitude in the Netherlands.